Intel Atom N450 : is a single core processor with a CPU speed of 1.66 GHz, 512 KB Cache, number of threads 2, 64 – bit instruction set and instruction set extensions like SSE2, SSE3, SSSE3, bus/core ratio 10, 45 nm of Lithography, 5.5 W of max TDP (Thermal Design Power/ Thermal Design Point – TDP – it is the maximum amount of power required by the cooling system to dissipate), 0.800 V – 1.175 V of VID voltage range, 2 GB max memory size, DDR2 – 667 memory type, one memory channel. The other technologies of the processor include Embedded options, Integrated Graphics, Intel Hyper Threading Technology, Intel 64, Enhanced Intel SpeedStep Technology (technology which allows the processor to meet its required performance for its operation during minimal power draw and heat dissipation), Thermal Monitoring Technologies, Execute Disable Bit. 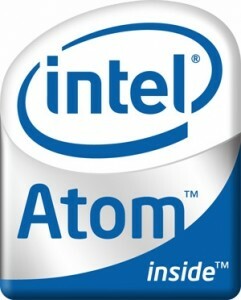 Intel Atom N455 : is a single core processor with CPU speed of 1.66 GHz, 512 KB Cache, number of threads 2, 64 – bit instruction set and instruction set extensions like SSE2, SSE3, SSSE3, bus/ core retio 10, 45 nm Lithography, 6.5 W of max TDP, 2.5 GT/ s pf DMI, 2 GB of max memory size, DDR2/3 memory types and one memory channel. 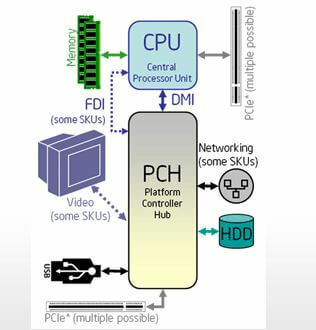 The other technologies of the processor include Embedded options, Integrated Graphics with a Graphics Base Frequency of 200 MHz, Intel Hyper Threading Technology, Intel 64, Enhanced Intel SpeedStep Technology, Thermal Monitoring Technologies, and Execute Disable Bit. 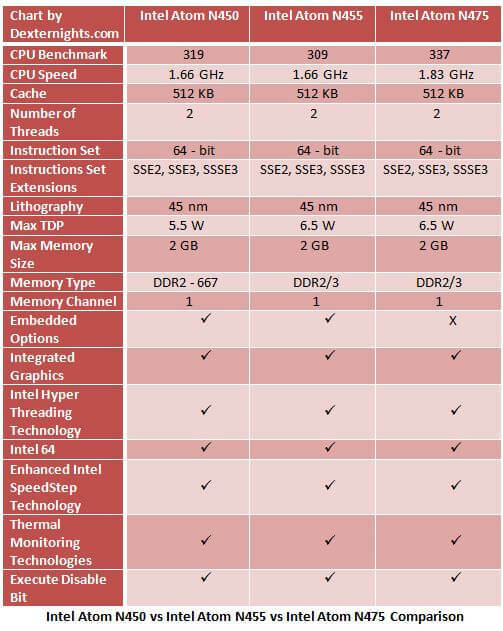 Intel Atom N475 : is a single core processor with CPU speed of 1.83 GHz, 512 KB Cache, number of threads 2, 64 – bit intruction set and instruction set extensions like SSE2, SSE3, SSSE3, bus/ core ratio 11, 45 nm Lithography, 6.5 W max TDP, 2.5 GT/s of DMI, 2 GB of max memory size, DDR2/3 memory types and one memory channel. Intel Atom N450 and N455 are exactly same except for support for DDR3 in N455. And since N455 was released after N450 (Previous quarter), the netbooks carrying the N455 are usually better. Whereas the N475 is a faster processor it also doesnt add much performance boost to be considered as an major upgrade and in terms of Price vs Performance N455 is better than N475 . And it is newer model than N450, it takes this battle easily. …the N450 will NOT step down a 800mhz DDR2 memory stick to 667mhz…2 gigs at 667 is it and there are no options in bios to change things. The 667mhz sticks are getting hard to find…most shops seem to have only the 800mhz sticks. Oddly though, the much older N270 in my now 2 or 3 year old Aspire One netbook seems to use the newer 800mhz two gig memory sticks just fine. Had to swap the 667mhz memory sticks from my old Acer to the new one to make things work.. so beware and make sure you find a 667mhz stick if you do a memory upgrade…shops won’t always take em back if you get the wrong one. i want to upgrade my ram to 4gb 800MHz it is compatible to my lenovo ideapad s10-3 or not?